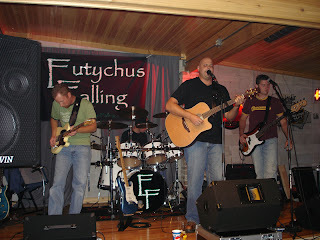 This is my friend's band Eutychus Falling. They RAWK, and rock pretty hard, I think. That's Josh Campbell on his banana colored guitar (this is actually an old pic - that guitar is now a sweet black with pinstripes), Brian Walker hiding behind the drums, Brian Weber on acoustic, and Josh Jahn bassing it up. Yes, Josh/Josh, Brian/Brian. I don't know if they planned that. They had a gig at Clayton's Tap in Morris. First one in a while, and it was a pretty sweet show. I sat with Josh Campbell's lovely (and slightly pregnant) wife Laura. She's the best! As the show was rocking, Laura made a comment about having to get Josh a new wedding band. Being the HVAC guy he is, he goes through them a bunch. He had been without one until Laura got him a replacement. It seems Josh was the target of some major pick-up action at the last EF show. So now his ring finger is adorned, again. Anywho....the show closes out (with Freebird - what else?) and Laura is all giggly and turns to me saying "I am so glad he is married to me, cuz I would want him SO BAD!". A cute statement, to say the least. So cute I had to mention it to Josh. Well, I am heading home and I think about what Laura had said, and it struck me - she is still in awe of her husband. He can still do something that amazes her. And I thought about my own marriage, and I really can't recall the last time my wife said "I am so glad he is married to me". And that is my fault, because when is the last time I did something that amazed her? If I can't excite my wife with getting the garbage out on time, or keeping the bills organized, or getting a door on the shed, how am I going to amaze her with anything else? How many other couples may struggle with their marriage because they don't amaze each other? I am sure in some couples, there exists an impossible level that one spouse can never achieve. That's unfortunate. Yet in so many others, doing the little things could really keep that spark around. And in doing the little, mundane things, there will be energy left so when you do something really neat, you can be a hero to your spouse. Oh my goodness did you make me veklempte - again! Saturday's show did rock, and I thank you from the bottom of my ever-swelling heart for the props to my hubby and his awesome band! Thank you also for the reminder of how wonderfully the good Lord has blessed me with my marriage. Josh amazes me all of the time. He is so talented, but even more than that, he is an incredible husband and father. He makes me laugh EVERDAY. Yes, everday. That's the key. Being hot and melting my face off with his guitar skills don't hurt either. You're awesome Jeff. And you are an awesome husband and father, too! How about a little gratitude?? ?